Help Dr Kassim Ahmad – Arrested on Blasphemy Charges! 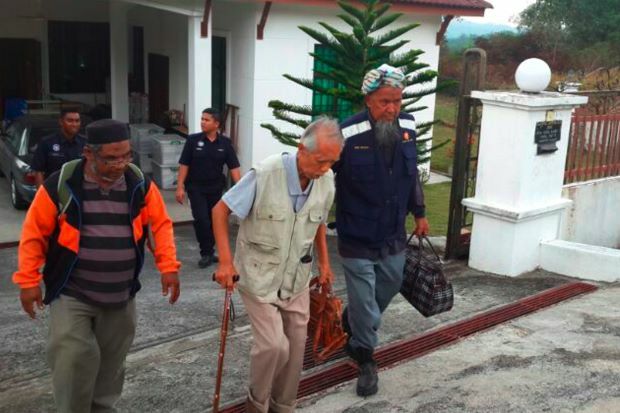 The dreaded but expected tragedy has happened – Dr Kassim Ahmad has been arrested on charges of blasphemy by the Department of Islamic Development of Malaysia (JAKIM). Please look at this picture above. This frail-looking elderly gentleman was taken away in this heartless manner for espousing quranist views and expressing them at a conference last February. Does the Quran condone wife-beating? Aren’t these verses proves that we have no free will to choose right or wrong path? Al-Ghazali and the Death of Freethinking. …is Al-Ghazali the death of free thinking and the cause of the “freeze” in Islamic progress? I have to disagree with her here as I do not see ‘default’ meanings as default at all. Much has been done to taint the Quran’s semantics and we need to put things right. Kashif Ahmed Shahzada’s, The Quran’s Sole Authority, is the most comprehensive refutation of the traditionalist claim that hadith and sunnah are a requirement for islam. The work proves that the quran is the only source of divine guidance and that the messenger was bound by the message. 8/20 O you who believe! Obey Allah and His messenger and do not turn back from him while you hear. 4/80 Whoever obeys the messenger, he indeed obeys Allah, and whoever turns back, so We have not sent you as a keeper over them. However, a remainder of this equation is often picked up on by opponents of the quranist position: why is the messenger mentioned at all? It is a valid question, given the argument is that obeying Allah and obeying His messenger are in fact one and the same. Is not the inclusion of the messenger then a redundant detail? Mohammad Sheikh of IIPC in his January 2005 presentation titled Hadith, gave an explanation as to what the two obediences mean. Shaikh’s contention is that there are verses in the quran where the messenger is being commanded to proclaim something to the people, such as 2/219. These count as obeying the messenger. Other verses where Allah commands us directly is to obey Allah. An alternative understanding is that the messenger is mentioned as a way of emphasis. Obeying the messenger is most certainly part of obeying Allah, but something in particular is being highlighted. The quran uses the word ‘and’ [wa] on occasions to highlight or emphasise a particular point. 2/238 Be guardians of your salawat, AND [wa] of salat al wusta, and stand with devotion to Allah. The word ‘salawat’ is the plural of ‘salat’ and ‘salat al wusta’ is translated as ‘the balanced salat’. So isn’t salat al wusta (the balanced salat) part of the salawat (plural of salat)? If ‘wa’ can only mean ‘and’, then it looks like salawat is one thing, and salat al wusta is something different. Even traditional commentaries of this verse concede that the ‘wa’ in this instance does not indicate that salat al wusta is separate from salawat, but rather it provides emphasis. The verse is stressing the importance of the balanced salat. 21:48 We had given Musa and Harun al furqan, AND [wa] shining light, AND [wa] a reminder for the righteous. Here again we see ‘wa’ being used when describing what Allah gave Musa and Harun. The verse does not seem to be suggesting the Prophets were given three separate things, but qualities and characteristics of the message they had been sent with. The repeated use of ‘wa’ helps to strengthen the idea that the guidance of Allah has different facets. The above two examples demonstrate that the word ‘wa’ in quran is more expansive compared to the English translation ‘and’. The potential is there to use it as a means for emphasis. With this in mind, is it possible that the ‘wa’ in the verses that say obey Allah and [wa] obey the messenger is there for emphasis? What is being emphasised, if anything? 42/51 And it is not for any human that Allah should speak to him except by revelation [wahy] or from behind a barrier [hijab] or that He sends a messenger to reveal [yuhiya], by His permission, what He wills. Indeed, He is Most High and Wise.